MAB 485 – Portable Magnetic Drill | Advance Drills Inc. Drill up to 2″ dia. & tap up to 15/16″ dia. 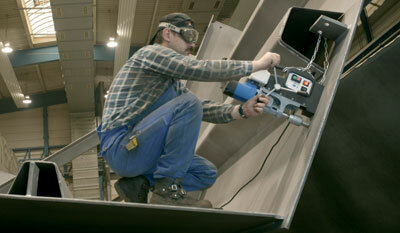 Tapping capacity 3/16″ to 15/16″ dia. With a 3/4″ chuck (left, Part No. 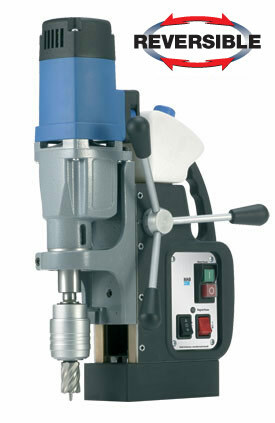 IBC 22), or MT2, this model easily converts to a standard drill press with a 5″ stroke for conventional twist drills. Twist Drill Capacity 7/8″ dia. Magnetic Force (1″ plate) 3750 lbs. Standard Equipment also includes molded plastic carrying case, operating manual, auto lubrication, safety strap, carabin hook, gloves, safety glasses, ear protection and allen keys.